The SoniCut™ 380 UltraSonic Cutter is a specialized cutting instrument which utilizes abrasive powders and high speed, vibratory motion to cut discs, holes, cylinders, squares and other shapes from hard, brittle materials. The high speed motion is developed using an ultrasonic transducer oscillating at 26kH. Boron carbide slurry is applied to the sample and the tool is lowered onto the specimen. The particles under the vibrating tool impact the sample and erode the material in the shape of the tool. Through careful design techniques, the entire transducer has some unique properties which enable the electronic circuitry to recognize the frequency at which mechanical resonance occurs. In the SoniCut™ 380 transducer, the electric voltage and electric current are "in phase" at only a single frequency - the mechanical resonant frequency. In operation, the frequency starts out at a low frequency. The SoniLoc™ circuitry scans the spectrum from the low frequency to higher frequencies until it finds the one frequency which yields "in phase" signals. By design, that frequency is the mechanical resonant frequency and the transducer operates at maximum mechanical amplitude. By using a carefully designed transducer and the SoniLoc™ circuitry, South Bay Technology has produced a transducer of extremely high efficiency. Titanium horn and SoniLoc™ circuitry maximize performance and ensure long term reliability. Automatic termination simplifies operation and minimizes operator supervision. Separate power and transducer controls allow specimen illumination lamp to be used without activating the transducer. 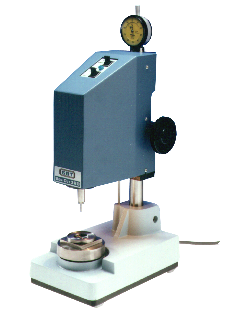 A dial indicator with 10 micron graduations continually displays depth of cut.